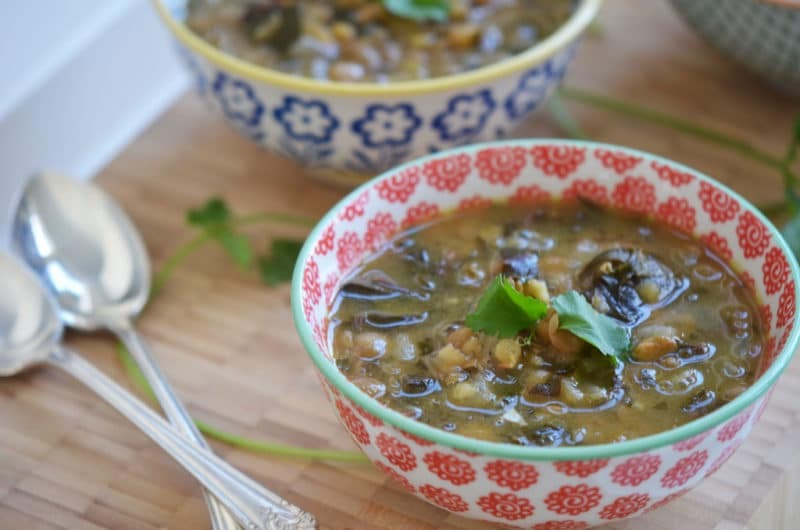 Lebanese lentil soup, or rushta, is a Lebanese staple. 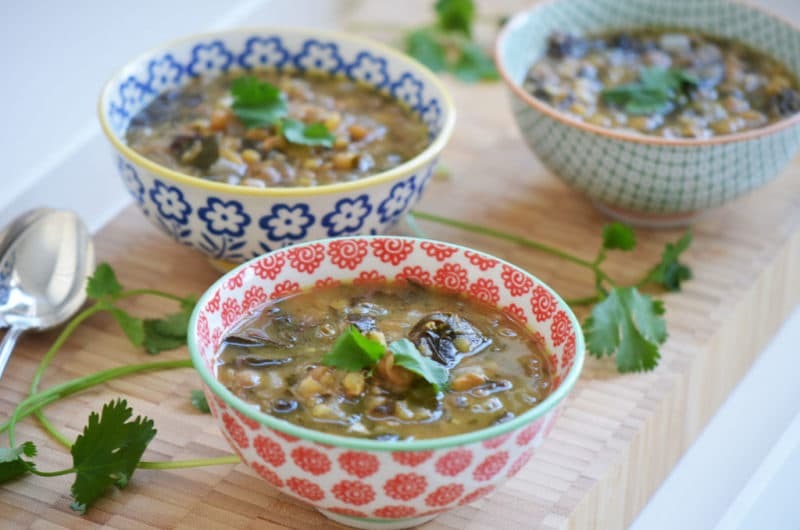 I love to ramp my Lebanese lentil soup up with plenty of garlic, a healthy and delicious addition of swiss chard, and lemon. Warming, good for you, and always a hit. I used to volunteer a lot. I hate to say ‘used to,’ but I’m trying to shame myself into getting back into it. When I volunteered in East Lansing and I’d see people I knew, they’d say “the apple doesn’t fall far from the tree,” referring to my parents and their community involvement. Seems that my volunteer projects have typically had to do with food, and the food of choice for many pantries that serve meals is, of course, soup. The scent of the bean soup that I served at Christo Rey in Lansing long ago remains imprinted on my brain. This wasn’t a scent that made me want to eat the soup—far from it—and I wondered why the food served to the poor couldn’t taste good, even though it was done on a budget. When I saw a call for soup-makers at my church in Chicago, St. Vincent de Paul, I raised my hand. I had been serving breakfast in their soup kitchen for a while and thought I would give the other soup makers a run for their money. The soup-makers were simply asked to stop by the church to pick up containers for transporting the soup from home. I knew we served a lot of hungry people in the kitchen there, but hadn’t given a thought to how many when I volunteered. The containers were ginormous. Huge. Four containers at five gallons each equals twenty gallons. If only I had done my math beforehand. Healthy, hearty, delicious soup (not tasty soup; delicious soup) that I could make with ease was top of mind. Lebanese rushta is the simplest soup around, a mix of lentils and thin pasta noodles cooked in water with buttery sautéed onions added to the mix. Rushta is loved by a lot of Lebanese. Plus I could afford to make many gallons of this soup a little easier than chicken noodle or vegetable beef. My hubris in thinking I could make mass quantities without a recipe or ratio guide was astounding. I based my ability strictly on growing up in a large Lebanese family. We know large quantities of food, I thought to myself, and held that as my mantra of the day even though I personally had not cooked large quantities of food, ever. Perhaps that hubris has served me well along the line for certain aspects of culinary school. But for the soup kitchen, not so much. I went after the soup making without much tasting along the way, and by the end I had gallons upon gallons of flavorless lentils that had absorbed most of the liquid and looked more like Mama Bear’s porridge than anything you’d want to eat. Soup was due that day, however, and I had spent the entirety of it cooking, so I wasn’t going to back down now. I salted, I peppered, trying to give the soup the idea that it tasted good even though it didn’t. That’s surface seasoning, the kind of doctoring up that doesn’t heal the wound. When I went in to serve my soup, I didn’t say that what we were serving came from my kitchen. The other servers didn’t say much, until we were ladling up the thick soup alongside the random assortment of donuts and white bread bologna and mustard sandwiches for breakfast (not kidding). Is it soup?, one woman asked. Who knows, I said. Then I watched as cup after Styrofoam cup of my soup was tasted by our homeless and down-and-out customers, and then…thrown away. I’ve had a kind of vendetta against rushta ever since it failed me. Because of course it was the soup’s fault. Whenever I hear cousins speak lovingly about their little pots of rushta, I think to myself that they just like it because they’re supposed to, or that one day I’m going to show that rushta, in a small pot, how to taste good. My friends, that day has come. 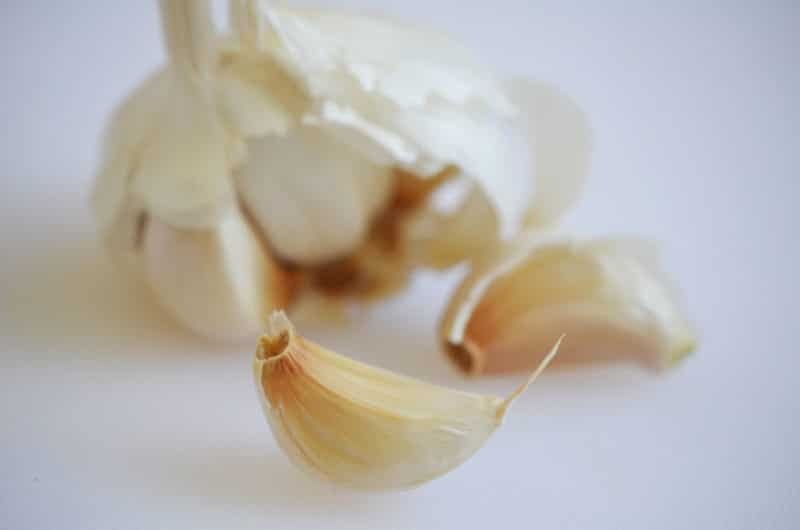 Lebanese cookbooks have taught me about all kinds of variations on certain traditional dishes that involve the real flavor-makers in any dish: herbs, garlic, greens, tartness, and seasoning that starts at the very beginning. Because no matter how hungry or tired or destitute you are, you still want to eat something that tastes good, and you know it when you do. You'll be tempted to eat up the garlicky chard and onion sauté before it goes into the soup. And that’s just fine because it tastes so delicious like that. But if it’s soup you’re after, just taste and then stir the fragrant mix into the lentils. This soup tastes best when it’s not piping hot, but has cooled down a bit and flavors can really shine through. A classic rushta also contains cooked pasta noodles like linguine, which can easily be added to the recipe below. 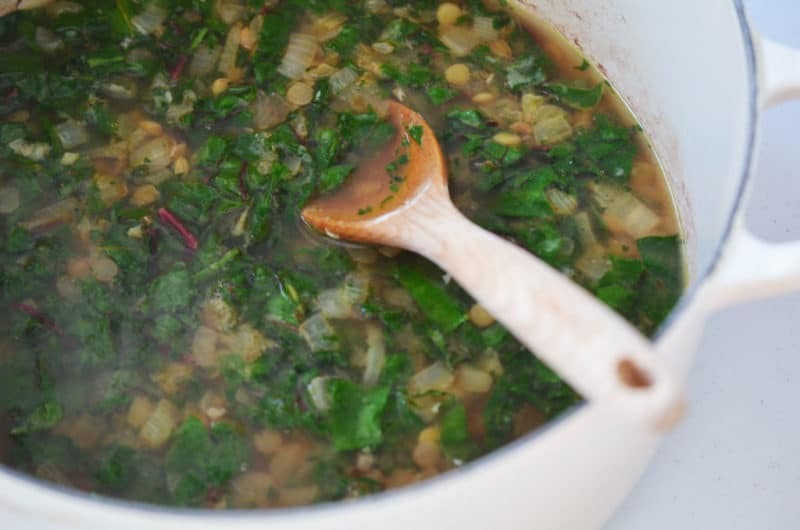 Once the chard mixture is added to the lentils, the longer it is cooked the more the chard will lose its vibrant green color and the more the lentils will soak up the liquid, so keep that cooking to a minimum. In a 2- or 3-quart soup pot, bring lentils, 4 cups water, and ½ teaspoon of salt to boil over high heat. Reduce heat and simmer, covered, just until lentils are tender, about 15 minutes. Meanwhile, in a medium sauté pan, heat the olive oil over medium heat. Add the onions and season with 1/2 teaspoon of salt, the coriander, and pepper. Sauté until very soft and translucent. Add the minced garlic and sauté just until fragrant, about 2 minutes. Add the Swiss chard and cilantro and sauté until bright green and tender. Sprinkle with flour and stir to combine, still over the heat. Add the Swiss chard mixture to the lentils, stir in the lemon juice, and heat through for just a few minutes. Taste and adjust seasoning. Serve warm, but not piping hot, for best flavor. Top bowls of soup with chopped cilantro. 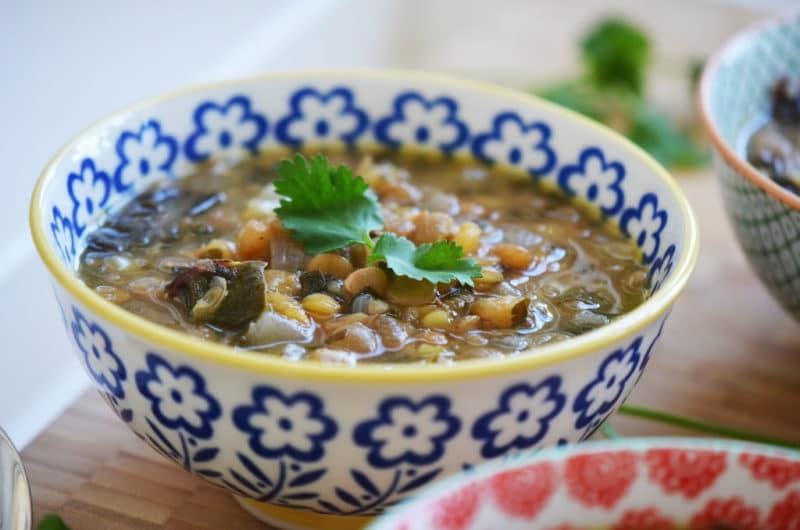 33 Responses to "Garlicky Lebanese Lentil Soup with Swiss Chard and Lemon; dressed up Rushta"
Love your column, love your pics, and LOVE rushta! Haven’t had it for years–I have yet to make it even once since I left my parents’ home many, many decades ago. I will need to try making it now! And I remember my mother making her own homemade noodles by hand–no home pasta machines in those days or in my grandmother’s day. Nothing beats homemade noodles for the rushta Diane! Go for it!! Can’t wait to make this rushta, Maureen! Thank you for your recipe. Let me know how you like it, Toni! That soup kitchen story made me feel all kinds of emotions! Mostly I LAUGHED! Not at you, but with you and with those little stinkin’ lentils that didn’t help you out of the woods. I’m excited to give my “little pot” a whirl with the lentils and see what blossoms. Love you Bridget, thank you!! Maureen, if you were using pasta, when would you add it and do you need adjust the liquid for that? Peggy, cooked pasta would be added to the final mix of lentils, onions, chard which is just heated through. This way the liquid ratio is fine. Love the photos and the story and of course that soup which we call adas b-hamod. Need to make it again! 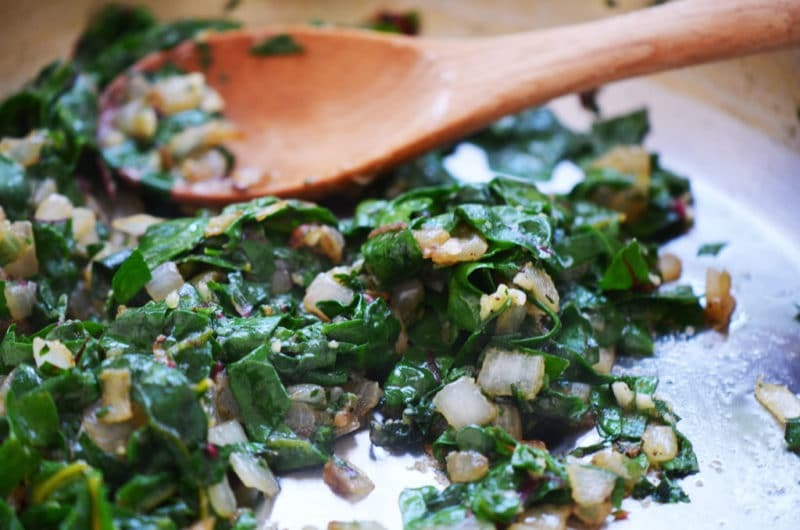 Definitely a great way to get rid of my leftover swiss chard & dried beans ! Yes, this soup ca be made with beans and/or chickpeas–delicous! Hi there Sara! Thanks so much for joining us here, and for your kind words!! I just checked out your site and am looking forward to exploring over there–very neat. P.S. I LOVE the soup bowls! Gorgeous! Thanks for that…I’m a believer that food tastes better in pretty china!! Maureen, I just made this soup for dinner tonight, but it smelled so yummy I had to try it for lunch. Fabulous version of Rushta. I simply love it! Easy to make and SO much healthier and flavorful than my usual recipe. Cousin, YOU WERE RIGHT! Thanks for bringing us new versions of our old favorites! That is great Celine!!!!! I’m glad you like it as much as your rushta. Love this recipe and really like your bowls. Where did you get them from? Anne thank you–those bowls are from Anthropologie! Thank you again for a wonderful blog. Am I missing how many the Garlic Rushta recipe serves? Hey Maureen I love your lentil soup version, as I am Greek and we make this just a lil different this sounds delicious as well. I have this obsession in my head to try this soup just like you made it but just by adding some dry roasted tomatoes What you think? And should I add them towards the end? Nice idea Peter! I would add the sun-dried tomatoes perhaps with the lentils as they cook, to soften them. If you want them chewy, add them at the end with the chard. You know when I was looking at your website and I was trying to figure out your name…. I “said” the same thing as your friend Maureennnaaaboood? lol . So did you attend Culinary are you a professional Chef? Funny!! I did attend culinary school! I don’t work in a restaurant but publish this food blog and am writing my first book, a Lebanese cookbook. I Loved this soup! Yum! I ate it with the round flatbread with olive oil and za’atar from Oasis Market near me in Oakland, CA. I will make it soon again. Hi Maureen from Sydney Australia. I am australian born to Lebanese Parents who migrated to sydney in 1950. My mum is a well known lebanese cook in the town I grew up in. Your blog is beautiful and the food looks authentic and true to the recipes handed down to me. Thanks so much Victoria! How I’d love to cook with your mother, visit with her and eat her wonderful food! I just made this and it was so delicious. I think next time I will double or triple the recipe so there will be leftovers for lunch. I would never think to put that much cilantro in soup. Yum! Thank you for sharing. It’s been 4 years and 9 months since you wrote this post, Maureen, and I can’t tell you how much it charmed me. I haven’t made the lentils yet, though I intend to (I miss my mother’s rushteh). But, your desire to give to others, your humility, your abject culinary failure, your determination, your charm, and your loving kindness all shine through in this post. Thank you for making my day! David, thank YOU for making my day with your beautiful words. I’m so touched and thank you for taking me back to this post. I haven’t been able to find chard locally. Can you suggest a substitution? Not a fan of cilantro – it’s one of those “you either love it or hate it” flavors. (Tastes like soap to me). Omit? What other herb might work? You could use kale for this, and for the cilantro, use parsley instead!